There is a temporary exhibit called “Geopalooza! A Hard Rock Anthology” at the Houston Museum of Natural Science. If you are in Houston this summer (until August 24), this is something absolutely worth checking out: you can see some outstanding geodes, crystals, meteorites, and fossil specimens. I have been to many natural history museums, but I rarely get as high as I did at the HMNS the other day [‘getting high’ is the right terminology here: you get to (or have to) listen to Led Zeppelin and Bob Dylan while looking at the rocks]. Even if you are not too much into rocks, minerals, fossils, and natural science in general, these pieces are so beautiful that they can simply be viewed as works of art. One of the museum curators was around when I was checking out this snake and she explained that the reason why the head bones are in such a disarray – compared to the beautifully arranged backbone and ribs – is that, as the snake’s body started to decompose, the easiest way out for the accumulating gases was through the head. Your photos are fantastic. Would you mind if I stuck a thumbnail of one on my blog? It’s easy to take reasonably good shots of subjects like these. Feel free to use any of the photos. I’ve never had much luck with pictures taken under museum lighting conditions (or any interior lighting, really); maybe it’s just the limits of my crappy point’n’shoot. Yes, a DSLR definitely helps: at higher sensitivity settings you can shoot without using the flash. Beautiful photos! Thanks for visiting the museum, and for sharing your experience. If you’re on Flickr, we would love to see your photos in the Museum’s pool. I know the person who found this specimen! I couldn’t believe it when he told me he found a snake. Whenever the guys I dug with would be digging, we would always joke about how we were going to be the one to find the snake! 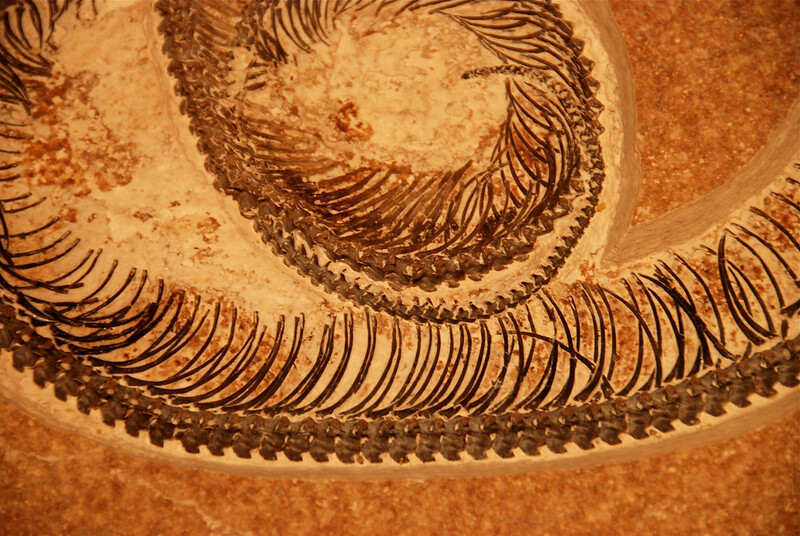 First one in over 100 years from the Green River Formation and only the second known snake ever found from there! Congrats Adam! 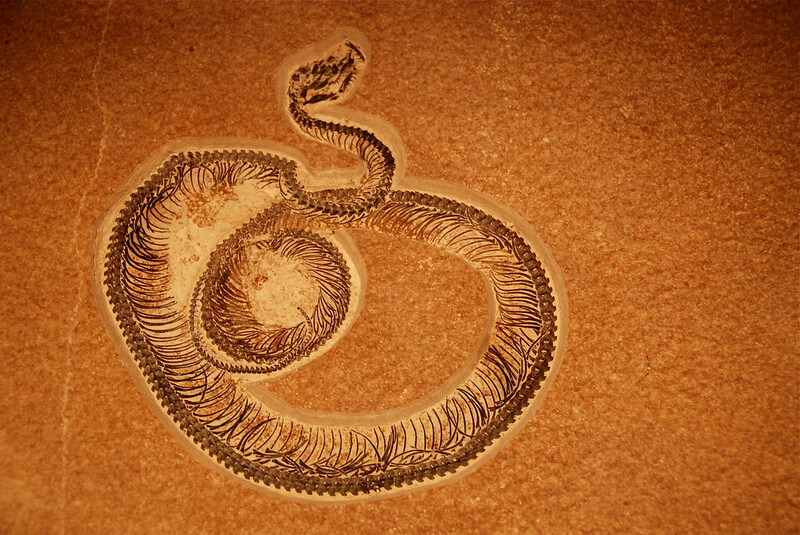 @ Agus – I am not an expert in fossilized snakes, but can have a quick look if you send me a photo. If it does look like it indeed is a fossil, I might be able to help you to track down a real expert.